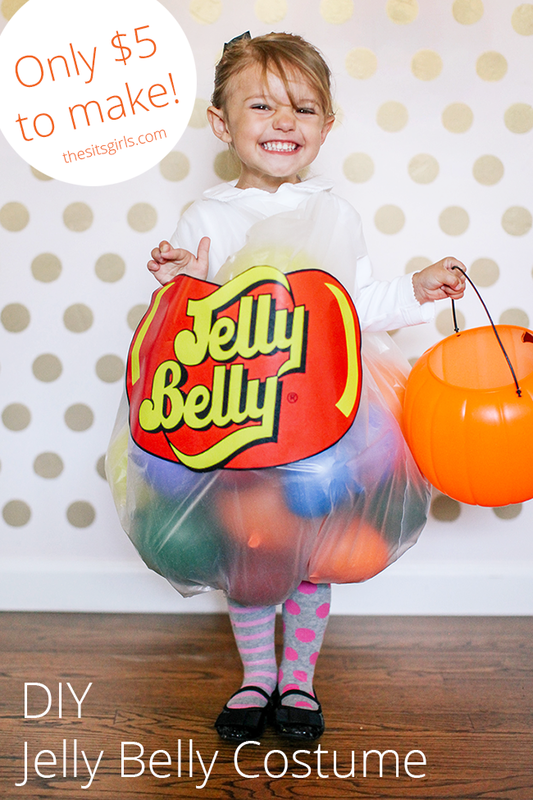 This DIY Jelly Bean Costume is the perfect Halloween costume for kids. 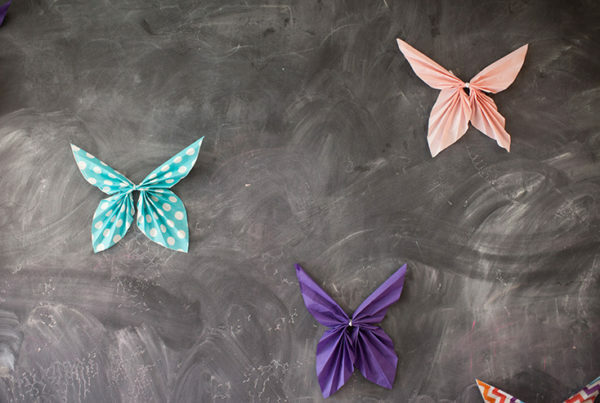 It will cost you a grand total of $5 for your supplies (or even less because you may have them around the house), and make you look like a Halloween Crafting Queen. 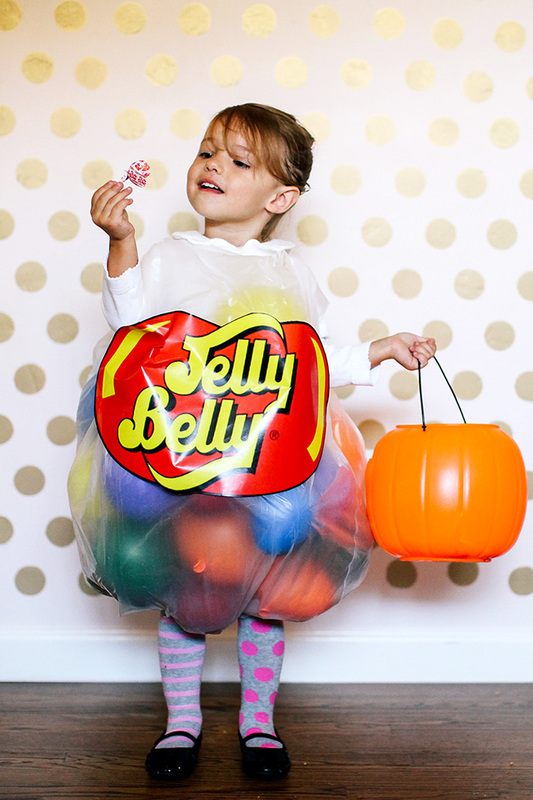 Your little one will have everyone ooing and ahhing over their cute and clever costume. I am a huge fan of making costumes for my kids. 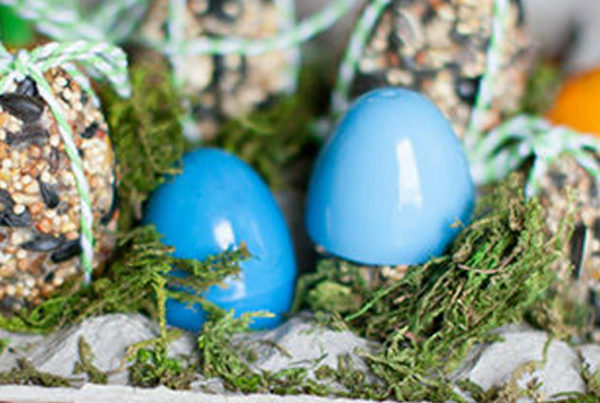 I actually love it, and start planning in June or July, I know that makes me a crazy person, but I am a sucker when I see a little kids in a homemade costume. I was also incredibly lucky growing up, because my mom is an amazing seamstress. She made us homemade costumes every year, so I feel like it is my duty to carry on that tradition as long as I can. That being said, not everybody has the time, resources, or the know how to make their child a costume. Or sometimes your kid sees a costume at a store, and is dead set upon wearing that for Trick or Treating. 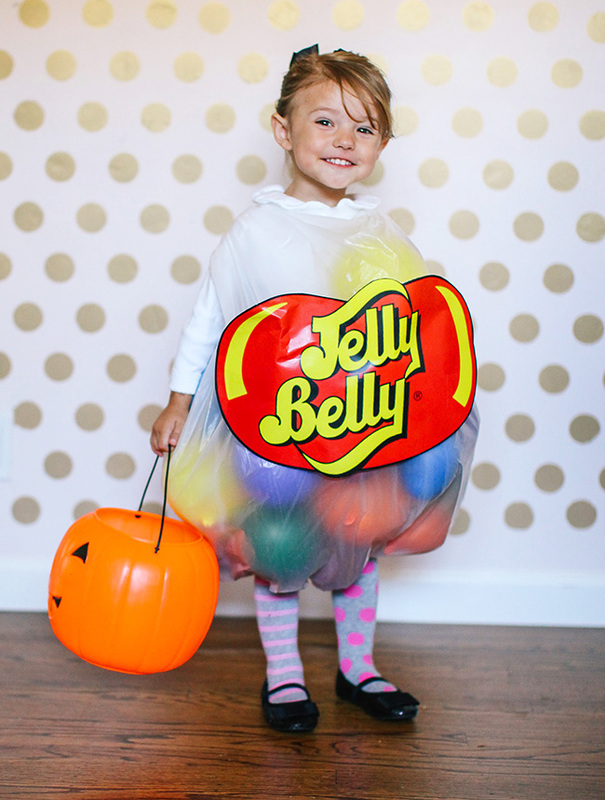 However, if you are still deciding what your little goblins and ghouls will wear for Halloween, this quick and easy homemade Jelly Belly Halloween costume is exactly what you need! Don’t worry — homemade costumes are totally doable. I promise. 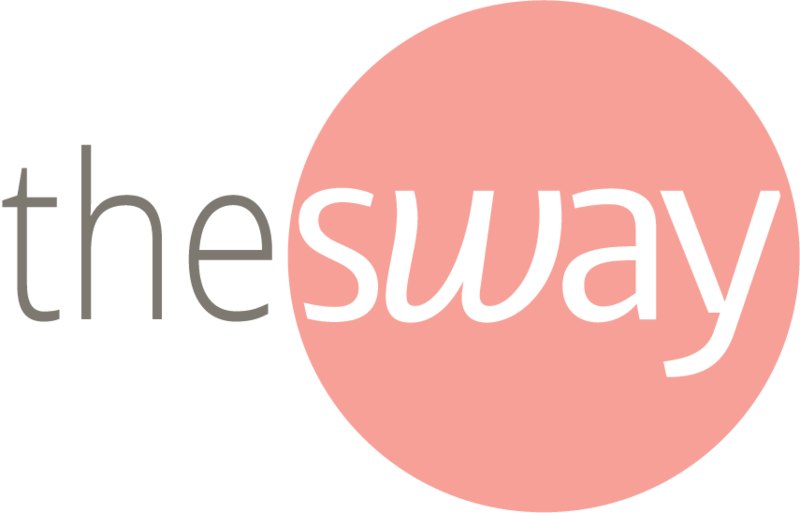 Once you have all your items assembled, you are ready to start crafting away. Blow up your balloons first (I used about 20 baloons), and make sure you only fill them a quarter of the way. 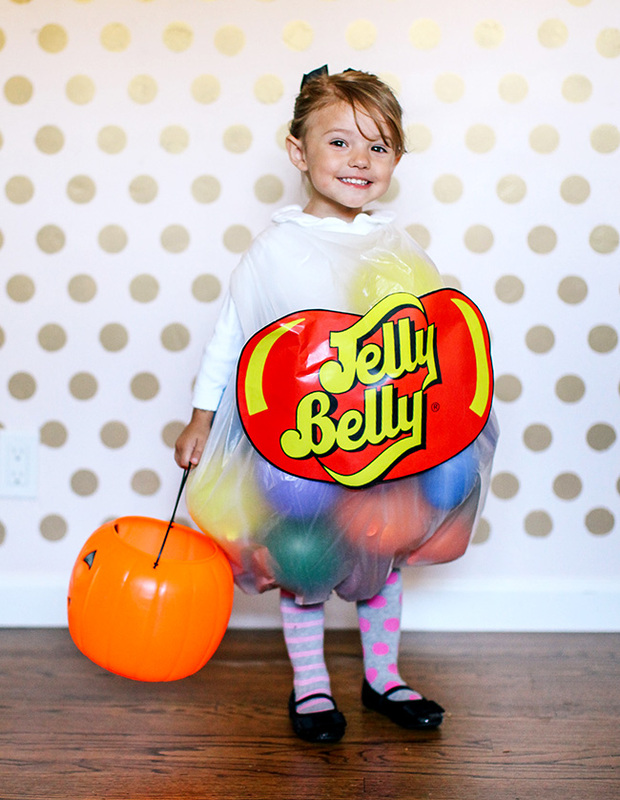 You want them to look small like Jelly Bellys, not like your kid is a mound of balloons. Also, do not fill the bag too much, or the balloons will not have any room to move around, making it super hard for your little one to sit or function easily. I laid the bag flat and cut two three inch circles at the bottom for my daughter’s legs. Nobody will see this part, so don’t worry about making the circles perfectly symmetrical. They just need to be big enough for your child’s legs to fit through. Next I had her step in, and pulled it up, to eyeball the height for her arm holes. I then cut holes for her arms. These were not perfect either, because nobody can see them. Once you have the holes cut, have your child step in, and fill the bag with the balloons. 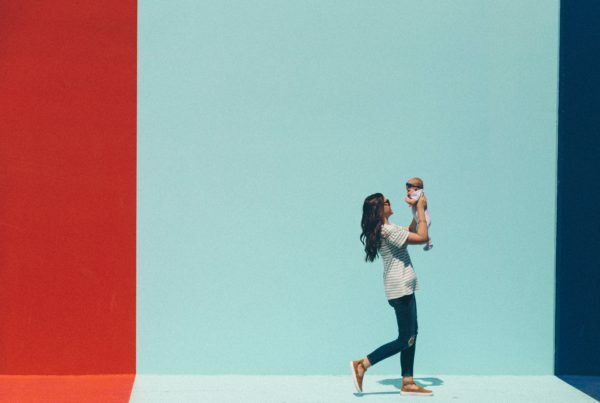 You can arrange the bag around the neckline so your child is comfortable, and fasten it in the back by using a rubber band, tying a knot, or a cute ribbon. 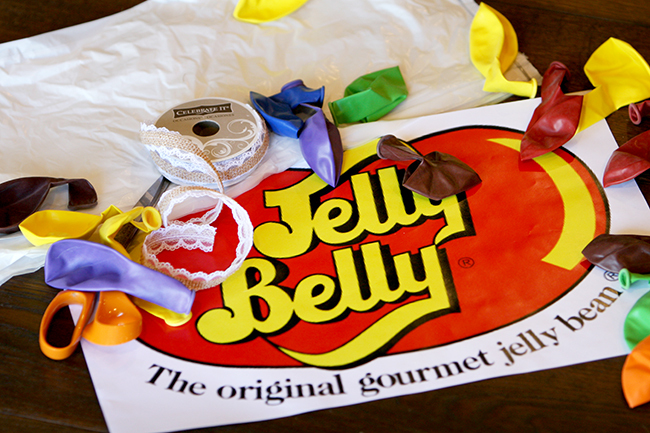 The final step is to place the Jelly Belly logo on the outside. I waited until the bag had balloons in it to do this, so I could tell the exact placement after the bag was expanded to its true size. I used a little hot glue to fasten mine, but super glue, or tape would work just as well. I put my daughter in some funky tights to really add some pizzazz, but any under clothing would work just as well. Finally, get ready for some awesome reactions from friends and family. This costume makes an awesome photo op, is super affordable, and makes you look like one crafty lady! After trick or treating your little one will have a ball playing with all the balloons as well. This Halloween your little one will have the coolest costume on the block with this winning ensemble, and your bank account will thank you too!